I used to hide under the duvet with Annie Nightingale and Stephen King. Back in the days before on-demand music and streaming, the radio was an essential (and magnificent) channel to discover new music. Nightingale’s request show and then her overnight dance shows were great sources for new music. So were the shows presented by some of her Radio 1 colleagues, and on independent stations – and Radio Luxembourg of course. That shows my age. A particular treat was to read in bed in the middle of the night with the portable radio hidden under the duvet. I also got into Radio 4 early on, especially Kate Adie‘s incredible, powerful and revealing broadcasts from all over the world. It was the start of an enduring love of the intimate medium of radio. I’m a media geek anyway and love the serendipitous discovery of fascinating facts which radio enables, whether related to science, nature, world affairs, business, policy, economics, psychology and so much more. In the 70s, 80s and 90s radio music DJs wielded enormous power and influence. As we know now, some abused this horrifically. The influence of radio music presenters has probably waned, but arguably the influence of talk show radio presenters has grown. For good or ill the Radio 4 Today Programme has an enormous influence on the UK’s “serious” national news agenda. Media pundits have predicted the end of radio for a while, but it’s not going away. People in the UK do now consume a range of audio content including live radio, streamed music, recorded music and podcasts – and on a range of devices. In Autumn 2018 I sought out up to date and independent research. 63% of UK adults listen to music-focused radio stations, while 38% listen to radio stations that are mainly speech-based. Three in ten say they use an online music service, while 16% (again, of adults) have listened to podcasts. I’m thoroughly excited by podcasts – and I think they complement the unique experience of live radio. Despite the range of ways through which you can now consume audio content the reach of live radio remains extremely high. Nine in ten people (89.6%) in the UK listen to the radio at least once a week – listening has remained at this level for the past five years. And people are listening to the radio for longer, now. Average listening per week increased by six minutes. Radio is highly trusted, too. Ofcom commissioned research into attitudes towards a range of local media which found adult consumers of local media have a high trust in local radio content. Get yourself interviewed on the radio! A few years ago I got involved with a community radio station, Sheffield Live! 93.2FM. It’s one of 200+ FM-licensed community radio stations in the UK. It has around 45,000 weekly listeners to its live programmes. As you’ll know I produce and present my weekly “Business Live” show on Sheffield Live (recent podcasts are here). But that all started by accident. I was there (alongside my other work) to help them to win contracts, to help them with some research, to secure investment through a community share offer (my target was £150,000 – I got them £160k, as covered in The Guardian here, which subsequently rose to over £185,000 when further members joined) and to mentor digital businesses – all of which I did. But whilst there I listened to more and more of their wonderful radio shows. Programmes on Sheffield Live are presented by volunteers. There are shows dedicated to Indie, Northern Soul, Motown, Folk, Funk, Reggae, World, Latin American, Rock, UKG, Dance and numerous other genres of music. All are presented by passionate and knowledgeable volunteers who love the music they play. Other Sheffield Live shows feature discussion about a wide variety of issues, comedy, film reviews and more. For many of the station’s radio presenters, Sheffield Live has been the first stepping stone to a career in media. Lots of folk have gone on to paid roles in the BBC and at commercial stations and production companies thanks to Sheffield Live. The media can be a notoriously difficult industry for young people to gain work experience in, and Sheffield Live should be credited for enabling many media careers. Plenty of Sheffield Live presenters aren’t doing a show as a pathway to something else, though – they have a career or other work but simply love coming and doing a show. I was impressed by Sheffield Live’s impact, loved their range of music – but the station didn’t have a programme dedicated to business and social enterprise. So I asked if I could start one. 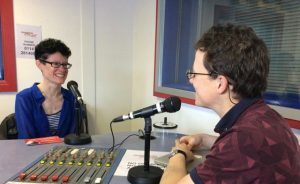 It’s not a “stepping stone” for me – I have plenty of consultancy work on and it complements some of that, since in my work I help business leaders get onto appropriate radio shows wherever they are (and train them to do it). I’d done a lot of BBC radio interviews on behalf of clients before presenting this show, and still do. I thought it would be for a few weeks or a year or two. But that was 5 years ago. I’ve continued the show because it’s such an enormous privilege to meet and pick the brains of interesting folk running values-driven businesses and social enterprises. And I’ve learned more about the amazing impact of community media, not only in the UK but across the world. Radio informs, transforms, empowers, enables dialogue and has, in many parts of the world, been a catalyst for solving problems, positive actions and positive changes in society. Yes indeed. Happy World Radio Day! The Business Live radio show, which has been broadcast on FM radio for 5+ years, features leaders of values-driven businesses and social enterprises. It is now also available on iTunes. UNESCO World Radio Day 2019. If you like reading useful, practical advice that’s also entertaining, then you’re welcome to join my free newsletter email list (if you’re not already signed up). Just pop your details in below.